There will be plenty of warm hearts and fond memories when you share a cup of Personalized Wedding Cocoa with your guests. 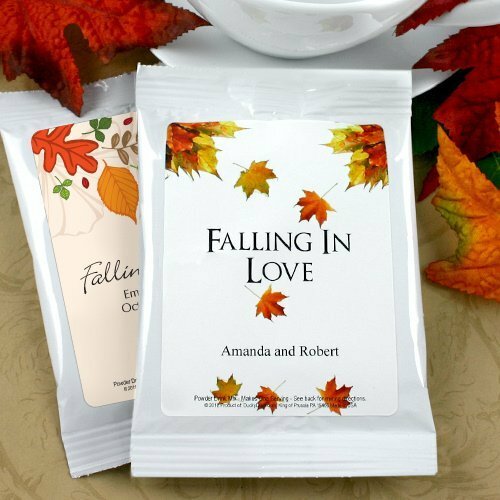 Each favor features a personalized label available in a variety of stylish designs to coordinate with any theme. 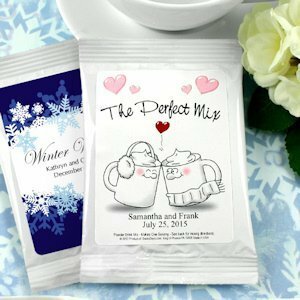 Each single serving drink mix comes in a white gloss pouch (4" x 5.5") with mix instructions and ingredients printed on the back. Make them uniquely you with three lines of text. Easy Assembly with self-adhesive labels, or for an extra fee we will apply the labels for you.